Darley Newman, founder of Equitrekking.com interviewed me for her Expert’s Corner. I hope you enjoy the article, as it is a fun read! This spring/early summer has been an extremely busy period for us at Relief Riders. In this newsletter you’ll find out about how we’ve been working with our alumni riders to raise funds for our programs, our newly formed partnership for tax deductible donations, a new media project and recent press. Many thanks to Alan Farnham, Senior Editor of Forbes Magazine who has featured Relief Riders International in a 2 ½ page spread in the magazines lifestyle section. The publication is dated for July 24th and it promises to be an exciting read! In May we finalized a partnership with an innovative technology company, Dragonfly, to bring our Relief Rides to life in the form of a dynamic digital media experience. The software program is called a Dragonfly Tour. Dragonfly has also asked to use our Dragonfly Tour to help promote their tool in its upcoming product launch. Please click here for the Dragonfly experience, and pass the link on to friends. I hope you enjoy watching it as much as we enjoyed making it. Many thanks to Pamela Baker, who rode with us on our October 2005 Rajasthan Relief Ride. In early May, she graciously hosted a successful fundraiser for our “Give the Gift of Sight” program in Houston, Texas. I flew down for the event, and had a great time meeting all of Pamela’s friends. It was my first time to Texas, and given that we have a large contingent of Alumni Relief Riders from the Lone Star state, I decided to pay a visit to some of them, as well – after Pamela’s event, I went to Dallas, where I spent the weekend with Dixon Bain (October ‘05 Relief Ride) and his wife, Angie Bain. The circle of giving grows wider each day, and I would like to thank those people who have asked their friends to celebrate their birthday by making a contribution to our exciting eye surgery and give a goat programs. It is very touching - both I and the people of Rajasthan appreciate it very much. Relief Riders International is Now Accepting Tax Deductible Donations! Because of the growing interest in our life-changing cataract eye surgery program, we have added some important new information to our website about blindness in India and how our approach to providing surgery is helping. Beyond statistics we share information about our philosophy and use of mobile clinics for treatment. We’ve also added a new detailed page of Frequently Asked Questions, which provides more detail on our mission and results. Click here to learn more. There are still spaces available on some of our rides. If you are considering joining one of our upcoming trips, call now to learn more. If you would like to make a reservation on one of our trips please e-mail us your mailing address, and we will send you a reservation kit. Khirod Relief Ride: Oct. 1-16, 2006 : Going back to Khirod is especially meaningful for us, since the people of Khirod provided us with the inspiration for our first cataract eye surgery camp. The riding also promises to be thrilling as we will travel through varied terrain such as dunes, dried up riverbeds, and spend a couple of nights in the Temple at Lohargal. New Year's Relief Ride Dec. 28 - Jan. 12, 2007 : We're planning excellent surprise festivities to celebrate the New Year! Day-to-day, riders will enjoy the unusual landscape which provides stunning views of the Sambhar Lake Salt flats paralleling the Aravelli hills. Our relief efforts will take us to Panchota where we will hold our free eye surgery camp. 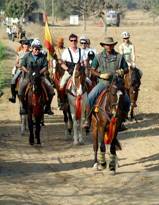 Nagaur Relief Ride Feb. 20 - Mar. 7, 2007 : One of the poorest regions of Rajasthan, the people of the remote and beautiful Nagaur region are often neglected by larger health service providers and are a wonderful group for us to serve. Providing visitors with a breathtaking experience of the Indian desert, the area gives riders the chance to travel through rolling dunes, visit imposing palaces, and take in the sculptured temples of red and yellow sand stone which display some of the finest creations of Rajput civilization. We hope that you will be able to ride with us in India, this fall. The experience will prove to be a unique experience filled with humanity and excitement! As always, please contact us if you have questions about upcoming rides or would like more information about our relief missions.